Casting call for a reality television series in Seaside Heights, New Jersey. The people of Seaside Heights are on edge over a local bar's casting call for a reality TV show whose details remain just foggy enough to leave room for the possibility of a "Jersey Shore" style series in the making. 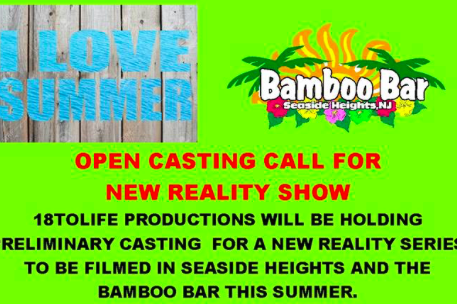 On Wednesday afternoon, the owners of The Bamboo Bar posted a notice on Facebook advertising an open casting call Saturday night for a series tentatively titled "I Love Summer." The description sounds suspiciously exactly the same as the old MTV series that ruined the reputation of South Jersey for a while and destroyed the GPAs of 16-year-olds nationwide. Comments on the post, shared by the Seaside Heights Boardwalk group, were overwhelmingly negative. "Oh God not again !!!" said Patricia Ann. "This is so upsetting," said Dawn DeLitizia Dalbo. "Those people made a mockery of our beloved town. To see someone trying to do this again is sad and disgusting. How can this be happening ???!!! Seaside needs to go back to its old roots of family and safety and good memories." "Bamboo owner: don't do it!" Lynn Flaherty pleaded. "Owners will 'resist' outside your establishment! We do NOT need a show again!" Other commenters doubted the legitimacy of the poster, pointing out that it doesn't specify a network. There is no record online of an 18toLife Productions, either. In effort to sooth the fears of locals, the Seaside Heights Borough posted a message on Facebook assuring residents that they have no idea what Bamboo Bar is up to and they will not greenlight a project that casts the town in an unfavorable light. In the wake of Hurricane Sandy, Seaside Heights has spent the past several years attempting to shift its image from a party destination to a family-friendly town. People there are certainly not looking for any more of this idiocy.